Look for scrumptious fall fruits and vegetables including sweet potatoes, apples, Brussels sprouts, butternut and spaghetti squash, and pears at farmers markets, your home garden, health food stores, and in produce sections of neighborhood markets. Each is loaded with nutrients you need to maintain health, and at the peak of flavor in the fall. In-season local produce is usually less expensive and fresher than stuff that is imported and/or has to travel thousands of miles to get to your market. We like to serve our family the freshest foods at economical prices, don't we? Note: I’ve mentioned this before in earlier posts, but it bears repeating. I encourage my readers to purchase certified organically grown foods. Ongoing research on organic foods as a group shows that the likelihood of exposure to contaminants such as pesticides and heavy metals can be greatly reduced through the purchase of certified organic products. Now Back to my Fall Favorites. SWEET POTATOES are sweet tasting, and are a comfort food for me. Perhaps it's mouthwatering taste is the same reason that this tater is so popular for Thanksgiving dishes and autumn meals. Although sweet potatoes taste sugary, eating them without butter or other fatty topping is helpful in lowering your glycemic index and reducing your hunger and sweet cravings. Orange or golden yellow fleshed sweet potatoes are rich in fiber and nutrients including Vitamin C. Eat the skin as well as the rest of this vegetable to reap the best nutritional reward. Sweet potatoes are a good source of potassium, Vitamin B6, and magnesium too. 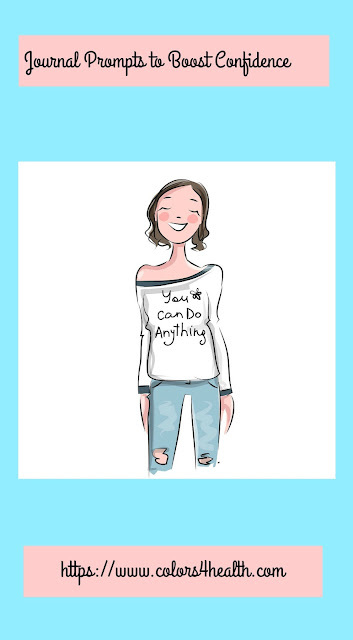 All work to lower stress, and munching on a sweet potato is a healthy way to fill yourself up without filling you out. Sweet Potatoes are rich in beta-carotene, which can prevent Vitamin A deficiencies, promotes healthy eyesight, and generates retinol production for healthy skin. Look for the recipe for miso sesame glazed sweet potatoes in an upcoming blog post. For a treat you and your family are sure to love try this delicious Maple Roasted Sweet Potatoes and Brussels Sprouts recipe from Katie Koteen at Well Vegan. APPLES are juicy, loaded with goodness, and make a perfect snack when you’re at home or on the go. Farmers nowadays grow thousands of varieties, ranging from sweet to tart. Red and Golden Delicious are among the sweetest apples. Pink Lady and Crispin are sweet and tart combined. Braeburn and Fuji apples are slightly tart. Granny Smith apples are the most tart, but retain their texture best during cooking. Whole apples are a much better nutritional choice than apple juice. Whole apples are richer in dietary fiber. Juicing drastically reduces the polyphenolic phytonutrient concentrations found in the whole fruit. Apples are loaded with vitamin C, and almost half of an apple's vitamin C content is just under the skin. That’s why it's important to eat apples with their skins. Apples contain insoluble fiber and water, which provides bulk and liquid in the intestinal tract that cleanses and moves food quickly through the digestive system. In addition, apples have soluble fiber, pectin. This nutrient helps prevent cholesterol from building up in the lining of blood vessels, which in turn helps prevent atherosclerosis and heart disease. Taste wise, apples are their best from September to November. Eat those that are organic and grown local for best flavor. BRUSSELS SPROUTS provide special cholesterol-lowering benefits and the most nutritious way to cook them is to steam them. The fiber-related components in Brussels sprouts do a better job of binding together with bile acids in your digestive tract, when the sprouts have been steamed. Want to lower cholesterol levels? Eat more steamed Brussels sprouts. This bold tasting green vegetable tops the list of commonly eaten cruciferous vegetables. Total glucosinolate (a phytonutrient and anti-cancer agent) content has been shown to be greater than the amount found in mustard greens, turnip greens, cabbage, kale, or cauliflower. 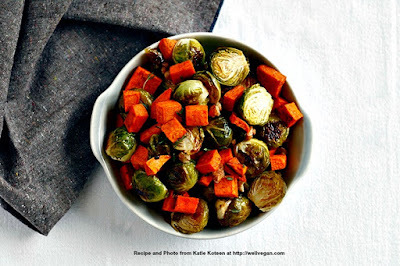 Consuming one cup of Brussels sprouts at 38 calories provides 195 percent of the DV for vitamin K, 125 percent of vitamin C, 3 grams of protein, and 10 percent or more of vitamin A, vitamin B-6, folate, potassium, and manganese needs for the day. 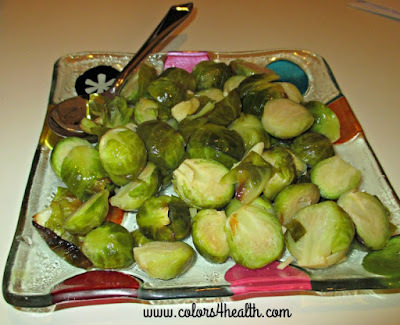 Brussels sprouts fulfill your DV for calcium, with 37 mg per cup. 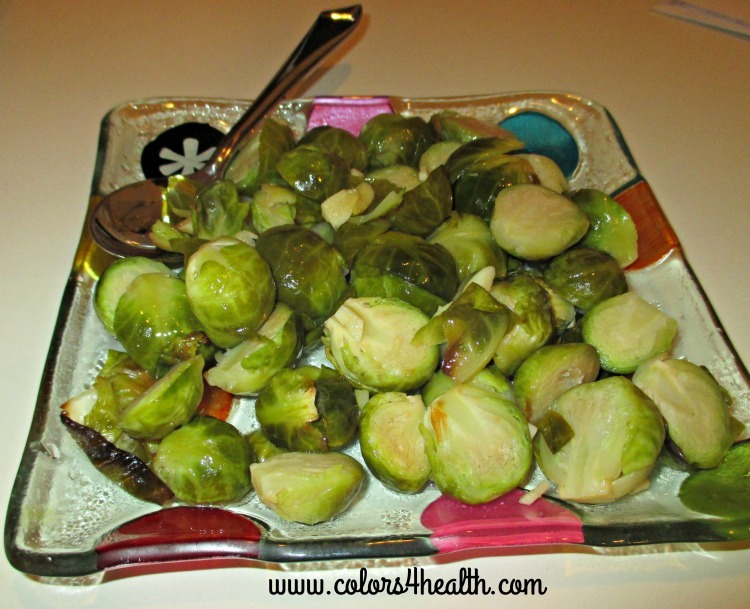 My favorite way to prepare Brussels sprouts is simple and satisfying. I buy 2 cups of Brussels sprouts or roughly a pound. I like the kind that is sold loose or on the stalk. That way, it's easy to pick and choose the best. 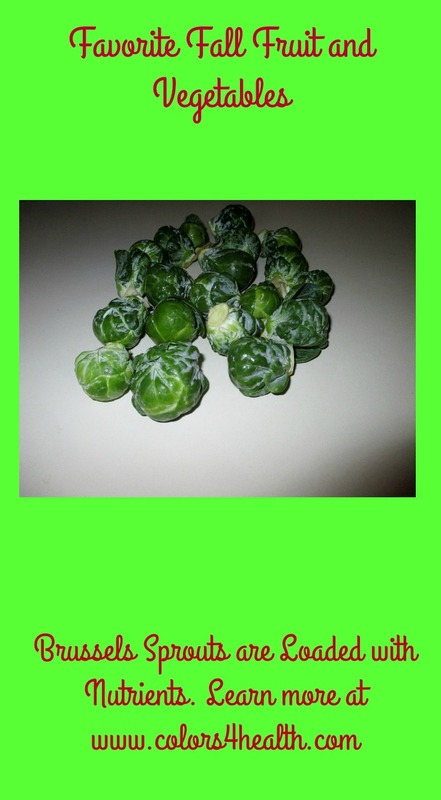 Select small Brussels sprouts, as they are the most tender and sweet. Clean off wilted outer leaves and cut off bottom. Soak and then rinse in cool water, cut in half lengthwise, and place in a baking dish. Mince 5 or 6 cloves of garlic and sprinkle on sprouts. Pour 1/4 cup water over the sprouts and stir so water and garlic is spread throughout. Roast in an uncovered baking dish or roasting pan in a preheated 425 degree F oven for 1/2 to 3/4 of an hour. 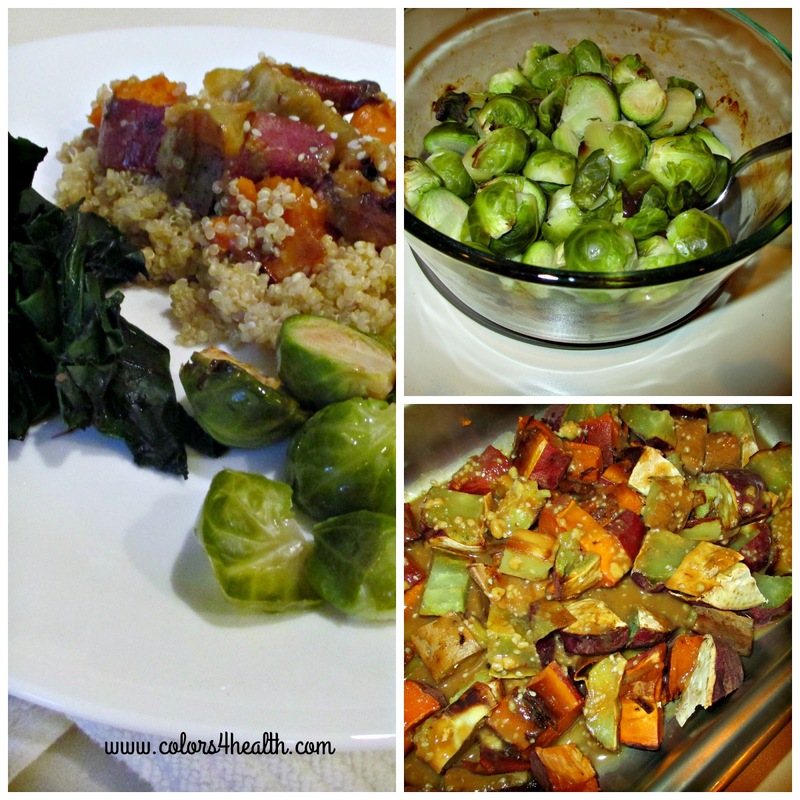 You'll know the dish is ready, when Brussels sprouts are crisp on the outside and tender on the inside. Place on a platter or into a serving bowl and drizzle on 1 Tablespoon of extra virgin cold pressed olive oil. Add fresh ground black pepper and salt to taste. If you'd like, add a splash of fresh squeezed orange, lemon, or lime juice for zing. BUTTERNUT AND SPAGHETTI SQUASH are favorites too, and the posts on my other blog describe why. Each post includes serving suggestions so have fun checking them out. PEARS are a luscious fruit that keeps you hydrated, because it contains so much water. It also packs a variety of helpful nutrients. Each medium-sized fruit provides about 24% of the Daily Value of fiber. 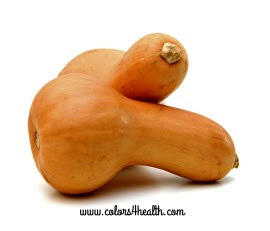 Much of its fiber is in the form of pectin, which reduces cholesterol and decreases the risk of heart disease. Its fiber also helps maintain healthy blood sugar levels, ensures bowel regularity, and reduces the risk of colon cancer. An ideal snack food that is a good source of vitamin C, pears provide 190 mg of potassium. 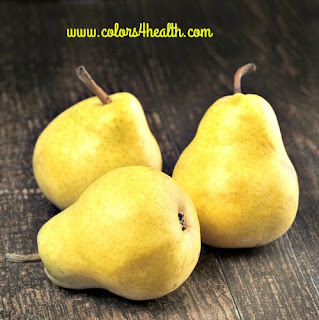 Pears have phytonutrients, including anti-inflammatory flavonoids, anticancer polyphenols and anti-aging flavonoids. Studies regarding pear nutrition have linked the fruit’s consumption with lower levels of constipation, kidney stones, high cholesterol, and even diabetes. Well folks...that's my take on Favorite Fall Fruit and vegetables. Eat color intense fall produce to maintain your health as well as enjoy their distinctive flavors. Before you go, please take a moment to comment. Scroll down, and comment at the bottom of this post. Please tell me about ways you like to serve fall fruits and vegetables. 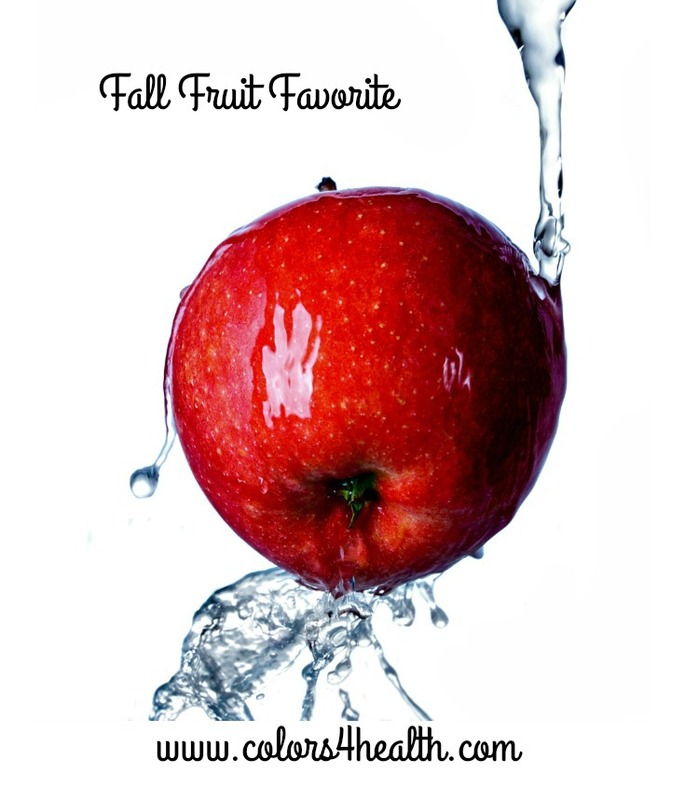 What new tips or facts did you learn about fall fruits and veggies? Why not let me know what are your fall favorites? Thanks Christina for your comment. You are so fortunate to like them all. Have a wonderful evening and please visit again. 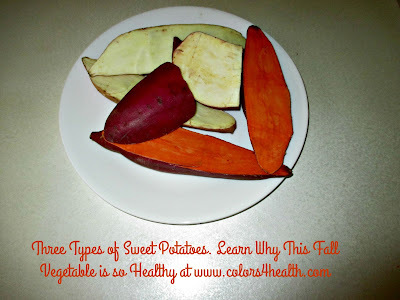 what a great idea to review fall fruits and vegetables! Those pears look so good. I'm looking forward to the fall harvest! Thanks Judee. Have a great weekend and enjoy your fall favorities.